This was a very exciting race. 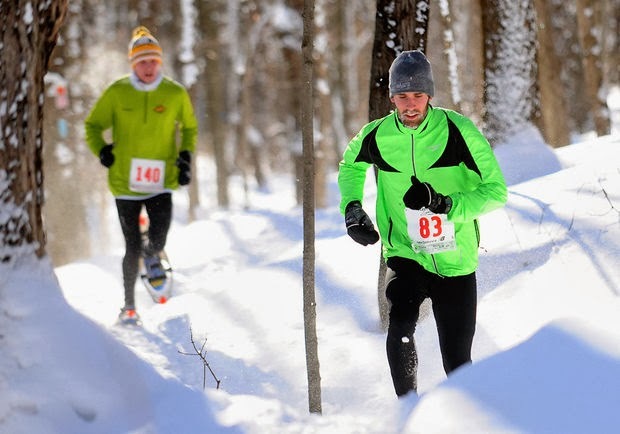 After a tough weekend as the Cockadoodle Shoe that saw me post-holing the whole way through I was primed and ready to race fast at the Highland Forest 10k also the New York State Snowshoe Championship. I woke up at 8 am and headed to Tim Horton's with my father for a delicious cinnamon raisin bagel and cream cheese. We then drove the 20 miles to the race site. 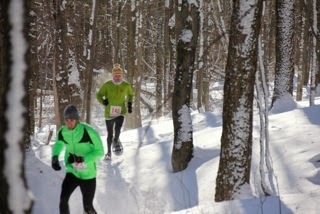 It was a race I had done last year and was the first where I felt like I could do this snowshoe running thing. 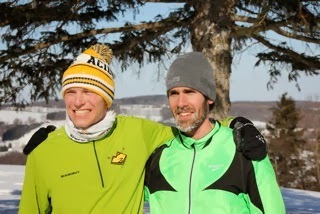 I had the chance to meet with Jack Hillenbrand who I have met through my job at Confluence Running and I convinced him to give snowshoe running a shot this weekend. What we found was that Jack was able to win his 5k race and qualify for Nationals with the hopes of making the US Junior National Team. I am very glad he gave it a shot! The race prep has always been the same with all of my other snowshoe races. I jogged about 10 minutes with Jack and warmed-up in cold 10 degree temps with a -5 windchill factor and hung out inside the lovely Highland Forest Skyline Lodge. If you have never been to Highland Forest, I highly recommend it as they have some amazing facilities all nestled high up on the hill. With like 2,000 acres of wild forest, this park has been labeled the "Adirondacks of Central New York". It really is something and the Skyline Lodge is awesome. Once inside, it was time to get those snowshoes on and race. To begin the race, I did in fact lead everyone off course which I take the blame for! 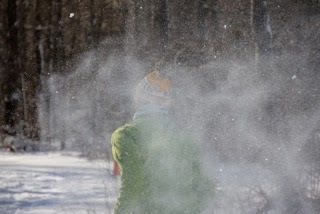 It was a cold morning with temperatures maybe with a high of 10 and with the wind like minus 5-10. Thankfully the Highland Forest course is all in the woods so the windchill would not be too much of a factor. I had my usual warm-up and prepared for a fast race. 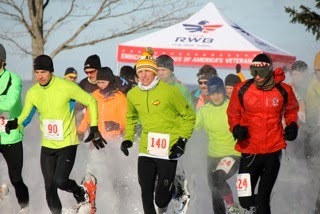 As this year was the New York State Snowshoe Championships, I was expecting the best talent out there. After the last race at the Cockadoodle Shoe, I was primed for a fast performance and I wanted to run controlled and strong, not to mention a smart race. From the gun I was in the lead running a nice pace. It was great to actually have some soft snow versus the potholing experience at the Cockadoodle Shoe which was disaster for me. Once the initial wrong course maneuver was fixed (which I thought something was off but I saw Eric Sambolec who has run this race many times and I thought if he is following then surely this is the right way). I then hear a loud " COLE! Wrong WAY! WRONG WAY COLE!!!" And as 45 runners were all bunched up, we pretty much just decided that the race had now began right there in the woods. I resumed the course and yes this new direction was in fact the right way. It was slow-going through the winding uphill single track. We hit a couple of road crossings with myself in the lead and Eric and another runner pictured above and below in the green Brooks Jacket right on my heels. I took it easy and ran a relaxing pace. MILE 2----- Once the single-track now became the nordic track, I began to open-up my stride. I still had my Brooks Green Jacket runner right behind me as I was kind of breaking trail which of course is exhausting. I felt fine though and had the plan that because we lost time going off course, I would run more conservative and then put in a huge move to end the race which would be great practice for Nationals. I hit the downhill sections and floated down them like I enjoy kicking up snow and adding some sizable time to my overall lead. I kept glancing back to see my lead of a few seconds turn into half a minute then to almost a minute. I hit the last downhill section before the slight uphill and back into the downhill single track. It felt great to be having a race where I did not feel like I was going to get stuck or do something to ruin my effort. On a nice section only less than a mile from the 5k point, I made a wrong turn and if it was not for the runner behind me, I would have been lost and would have had a lackluster race so Thank you! I quickly turned around and sprinted the minute or so to get back onto the trail. Now I was in second. The Brooks runner gained some time on me here and I fought the last mile to close on him from maybe a full minute deficit to about maybe 3 seconds. LAP 2----Here is the photo above of us coming out of the woods only steps away from the official 5k mark. As you can see I was catching up. As we came out of the woods, our split was 27 minutes or so which was not bad considering we took a half mile detour. That would mean we were on pace with my time last year if not faster by almost 30-60 seconds. This was a great confidence boost knowing I was running a quicker time than last year with the course detour. As we merged onto the uphill single track I was almost caught up with first place. I surged on sections he looked like he was halting and was able to pull-up right on him. On some sections he would try to gap me, but I held my ground. 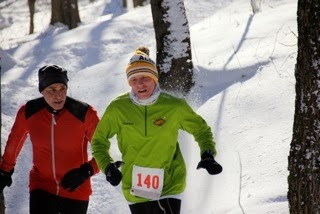 Out of the single track we hit the nordic section with him kicking snow up into my face and still I remained unfazed. I kept right on his heels all the way until the last turn into the woods for the final say half mile to mile or so. Something out of the blue happened, he asked me if I wanted to pass. Without hesitation I said "Sure" and proceeded to take the lead. I made a nice move and then meandered through some of the other finishers of the 5k and headed for the finish. I was preparing my move in the race as I was asked to pass and had now established my finish. Coming into the last straight. I put the pedal on high and finished the race. My time was under 51 minutes probably pretty close to last year's time which meant we had run under 8 minutes a mile and what was a perfect day for a race. 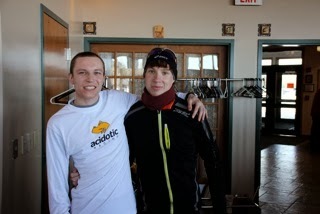 The snow conditions were not too bad and minus two wrong turns, the race was a lot of fun. 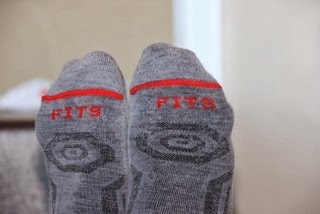 Fits Socks Shout out--Warm and Dry feet the whole way and never once did I have my sock bunch-up! THOUGHTS: This race boosted my confidence. I was worried I did not have it this year for snowshoe running with my mishaps but that I have been feeling nice and relaxed these races and still having tons left in the tank in terms of energy is a great sign. I think at Nationals running the race smart and controlled with the top pack will work out really well as I sit and wait for my moment to really go for it. I am fit and even with this super cold winter and lower mileage weeks for me than in most winters, I have had solid quality runs and that is why I think I have kept my fitness much higher than it ever has been. My next race will be near Valentines day out in Hazelton, PA area at the Pennsylvania State Championships. I hope to run this race really fast from the get-go maybe 2 miles of control and 4 miles of all-out speed. We will see. I will use that race as my last tune-up before Nationals which I cannot wait for. Last year was so much fun and I think this year will be even greater!